The world premiere of the Northern Ballet’s production of 1984 is only weeks away, and its choreographer, Jonathan Watkins, is finessing a pas de deux with the principal dancers. The Independent on Sunday has been granted exclusive access to the rehearsals and so I am able to watch Watkins work his magic with Tobias Batley and Martha Leebolt, who will take on the roles of Winston, the hero of George Orwell’s dystopian masterpiece, and his lover, Julia. Six other dancers mark out the steps behind the graceful pair and it is extraordinary to witness the ballet come to life, set to an original score by Alex Baranowski. 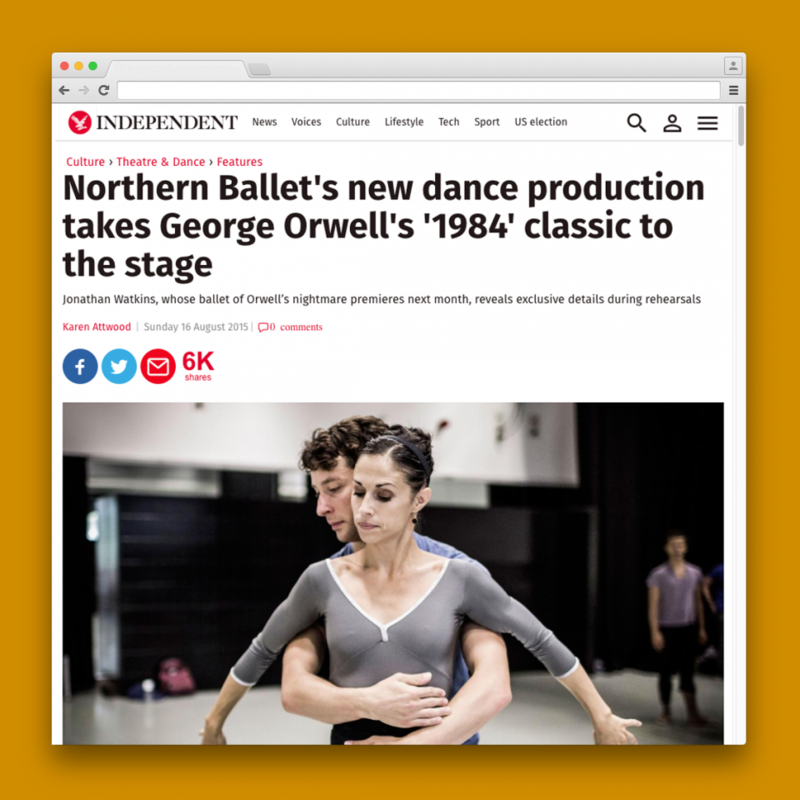 It is thought to be the first full-length ballet based on Orwell’s novel. Watkins had the idea for it after he was approached by Northern Ballet, which had been impressed with his version of Kes – a ballet that ran last year to acclaim at the Crucible Theatre, Sheffield. “I was only really interested in doing this story,” he tells me before the day’s rehearsals start. “With a big undertaking like this, and with this kind of creative process, you need to know the material inside and out, be really passionate about it and really engaged with it. Watkins has not seen Headlong’s stage adaptation of 1984, currently running at the Playhouse Theatre, London, and has deliberately avoided the film version starring John Hurt and Richard Burton, which came out in 1984 – which is also the year Watkins was born. Watkins, 31, grew up in Barnsley, the son of a builder and a teacher. A friend, spotting him dancing at a wedding, advised his parents to send him to dance classes, and he joined a local ballet school at the age of eight. He won a place at the Royal Ballet School in London four years later. He says it was hard to leave Yorkshire to board in London at such a young age, but he adds: “I would not be where I am now, so it was worth it.” Watkins was a dancer with the Royal Ballet Company for 10 years after graduating from the school and while there he realised his true calling as a choreographer. He no longer performs. Although Orwell’s predictions have “so much relevance and reflection on how we are living now”, Watkins did not wish to set his ballet in the present. There must be challenges in transforming such a famous novel into a ballet? Because the Inner Party that rules the world of 1984 does not see the proles as a threat, Watkins has allowed them to “move as though there aren’t restrictions on them”, in contrast to the Outer Party members, who have “a unison and rigid sort of classicism to their movement”. Watkins started thinking about the concepts for the ballet not long after the start of the Arab Spring uprising, and images of people rising up in protest against their governments informed how he thinks about the proles in the ballet.